Parenting Instructor: Making a happy home isn’t like flipping on a light switch. 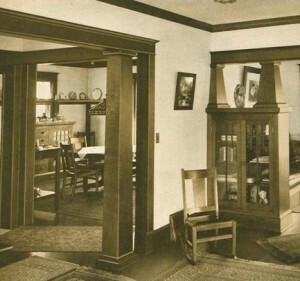 Originally, there weren’t a whole lot of light switches (or, indeed, electrical outlets) in this house. Most of the lights would have been on pullchains, and the switches are generally retrofitted. 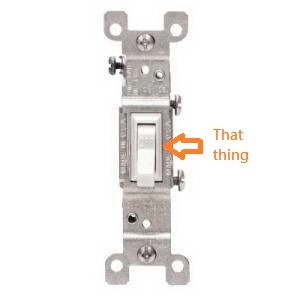 But our living room had a switch that was original in its entirety, from the wiring to the plate. 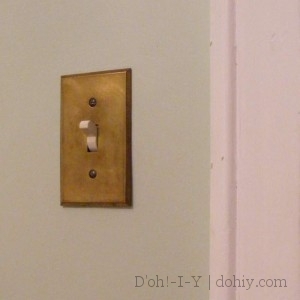 When we rewired the porch and living room lights, I wanted to keep the brass plate for these switches and the outlet plate below it on the wall. I liked the patina, and given some of the stupid things that had been done to the house over the years, the fact that the plates were still there was a bit of a triumph. But how to use a push-button switch plate in a post-push-button world? Well, there’s a whole reproduction-hardware economy built around first-world problems like these! We replaced the old push buttons with these from Classic Accents. These don’t have quite the operational “CLUNK” of the original, but they look virtually identical — and hey, they’re UL-listed, so they turn the lights on and off safely. Bonus! I’ve also seen rebuilt originals (check ebay) and some non-UL-listed reproductions if you are shopping. After we got that bit of wiring done, Kev said, “Hey, wouldn’t it be nice to make the other plates in here match the originals?” I said, “Are you taking the role of Stacey in the play today?” and started looking for brass switch and outlet plates. They are out there, but for more than I wanted to pay — plus, no patina. But at the salvage places, brass covers are about $4 a pop. They are often paint-coated, but pop ’em in the Crockpot, and it’s instant history time. After. If super-shiny is your thing, these would buff up nicely as well. 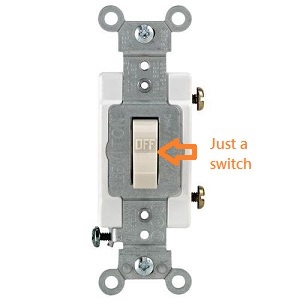 When using vintage switch covers, you may need to change the switch itself. 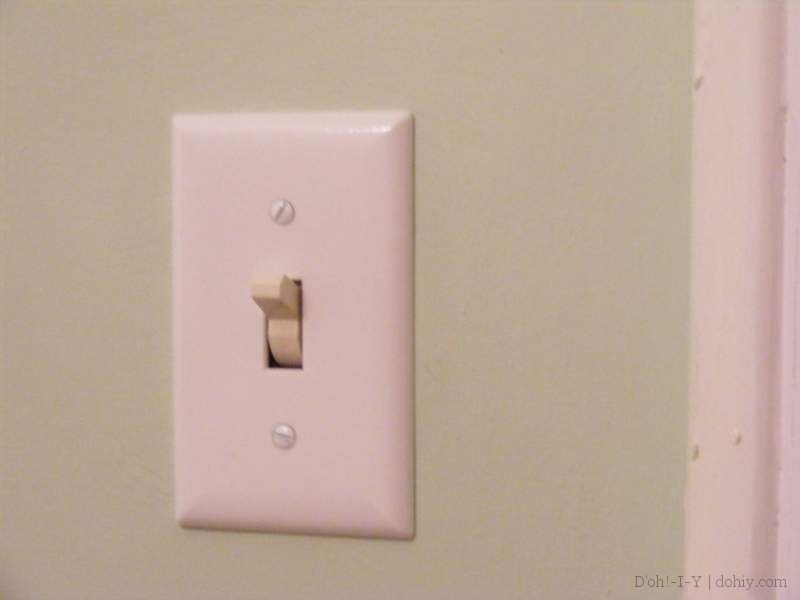 The hole for a regular switch is a tiny bit smaller than the current standard. Switches with the plastic box surrounding the switch are just a titch too big for the vintage plates. What you want is the fatter switches that look bigger overall, but without the casing around them (which has nothing to do with function in any event). 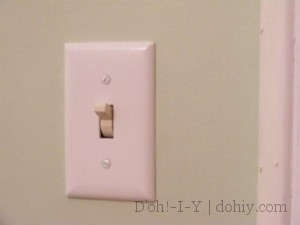 If you need to do it, changing switches is easy, but be careful and follow all safety precautions. Old metal outlet covers will fit standard electrical receptacles with no trouble (and if needed, you can find double-gang covers with some patience). For either switch or outlet covers, if you don’t have brass flat-head screws, you can fake it by painting the screwheads on the standard fasteners you remove with the plastic plates. These vintage covers are a quick, easy and cheap way to restore a bit of character to an old home. It’s one of the easiest restoration projects you can do — and with an old house, those easy projects don’t come along often! This entry was posted in Before & After, Decor, Electrical, Walls & Floors and tagged how to replace plastic electrical plates, how to replace push button light switch, old house details, push button light switches, vintage light switches, vintage outlet covers, vintage switch covers. Bookmark the permalink. Love them, they definitely suit the style of your home so much better (and go with your amazingly restored lamp). When we were looking for houses, we found some that actually still had the old victorian servants bells (although those houses were way out of budget). How cool would they be? Yep, I wouldn’t either. Pretty sure that’s why Jan (with a slight look of panic) kept dragging me away from them! 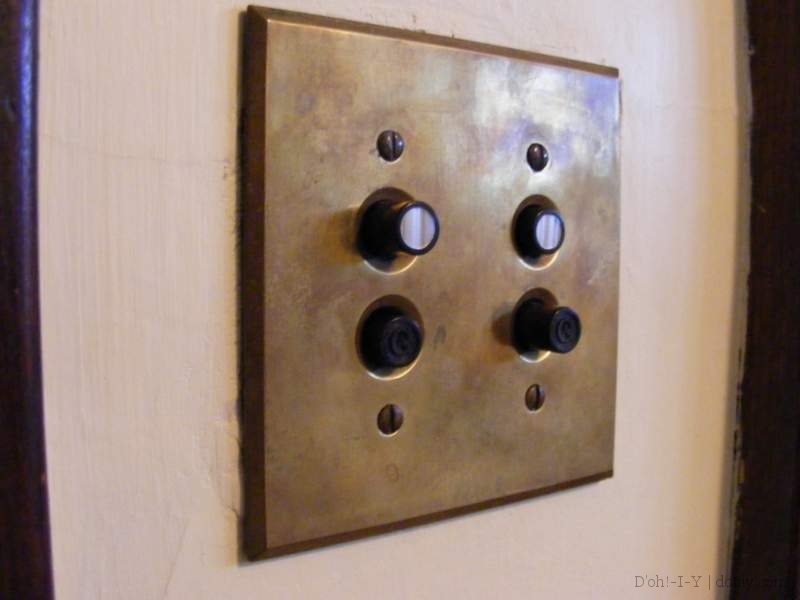 Question of the day – where do you get screws with a nice patina to match your switch plates with a nice patina? Eric, you can get brass screws for the switch plates, which will patina over time. What I usually do, though, is dip a regular plate screw into some bronze-colored paint, which makes them blend in right away.